극락보전 후불벽 앞면에 그려져 있는 아미타삼존불벽화이다. 앉은 모습의 아미타불을 중심으로 왼쪽에 관음보살이, 오른쪽에는 지장보살이 서 있는 구도를 하고 있다. 화면의 맨 위부분에는 구름을 배경으로 좌우에 각각 3인씩 6인의 나한상을 배치하고 그 위에는 작은 화불이 2구씩이 그려져 있다. 아미타극락회도 장면을 그린 이 벽화는 앞에 모셔진 아미타삼존불상과 매우 비슷한 모습을 하고 있다. 중앙의 본존불은 비교적 높은 연꽃대좌 위에 결가부좌한 모습으로 양어깨를 모두 감싼 옷을 입고 있으며 뒤로는 키모양의 광배가 표현되었다. 왼쪽에 서있는 관음보살은 머리칼이 어깨 위에 흘러내린 모습에 얇고 투명한 겉옷을 입고 있으며, 오른쪽의 지장보살은 오른손으로 석장을 짚고 왼손에는 보주를 들고 있는 모습이다. 채색은 주로 녹색과 붉은 색을 사용하였다. 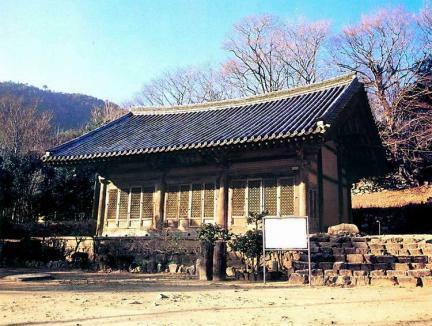 조선 성종 7년(1476)에 화원 대선사 해련에 의해 조성된 것으로 추정되는 이 벽화는 온화한 색채나 신체의 표현 등 고려시대의 특징적 요소를 가지고 있으면서도 간결한 무늬나 본존불과 같은 크기의 기타 인물 표현 등 조선 초기 불화의 새로운 특징들이 잘 나타나 있어 고려식 조선 초기 불화연구에 중요한 자료이다. 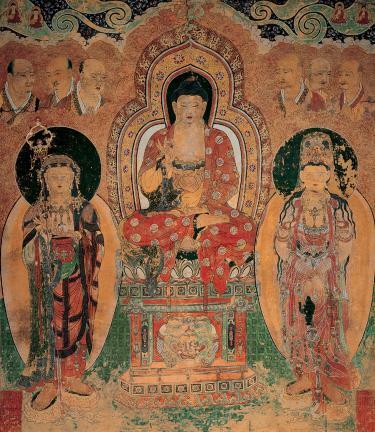 The mural painting shows the image of Amitabha Buddha seated at the center flanked by the images of standing Avalokitesvara and Ksitigarbha Bodhisattvas. 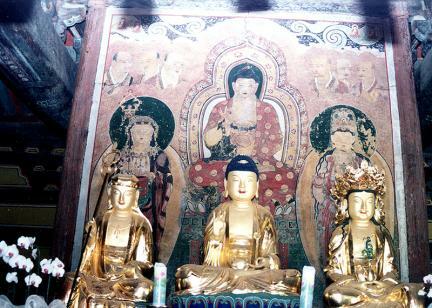 Clouds are in the backdrop, with three arhats on each side. 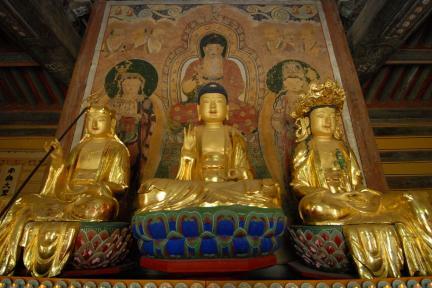 The mural about the Pure Land of Amitabha appears to be quite similar to the images of Amitabha Buddha’s triad next to it. 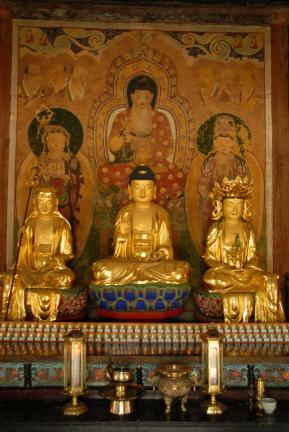 The image of Amitabha Buddha at the center is seated cross-legged on a high lotus pedestal, with a robe worn on both shoulders and a halo above the head. 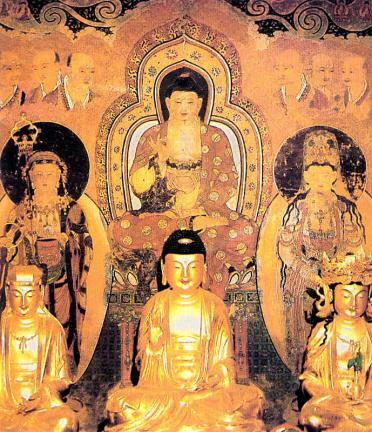 Avalokitesvara Bodhisattva standing to his left wears a thin, transparent robe, with hair flowing down the shoulders. 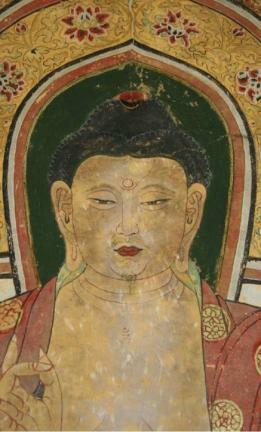 Ksitigarbha Bodhisattva on his right holds a cane on the right hand and a magic bead on the left hand. Green and red were mostly used. 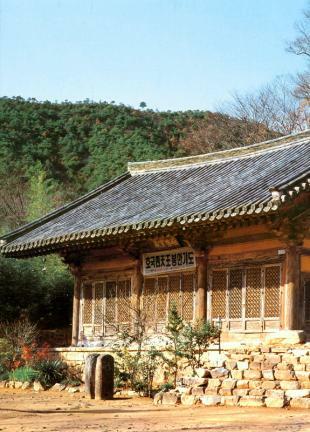 The mural, which is said to have been painted by Master Haeryeon in 1476 (7th year of the reign of King Seongjong of Joseon), displays the characteristic features of Buddhist paintings of the early Joseon Dynasty with simplistic patterns and expression of figures, at the same time containing the features of those of the Goryeo Period with gentle colors.